Located about two hours south of Tampa, City of Palms Park is adorned with thriving palm trees and bright flowers, making the landscaping one of the highlights of this park. 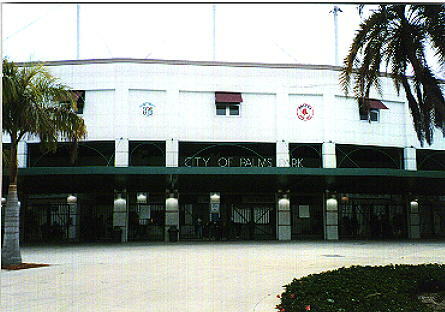 Since the Red Sox are a large-market team, City of Palms is a fairly large park, and it was a packed house when I saw them play the arch-rival Yankees. Despite the large size, City of Palms Parks is a spectacular facility with a lovely ambiance. Very good views, and just a fun, gorgeous looking place to see a game. The clean and bright concourse is very refreshing, and although it is large, you can find a good view from almost anywhere in the stadium. Like most parks, parking is not a problem. I would definitely recomend this to anybody. The plant life around the stadium is its most appealing feature. While this picture does not do the stadium justice, it gives you an idea of the type of plants, namely palm trees, that adorn the stadium's grounds. 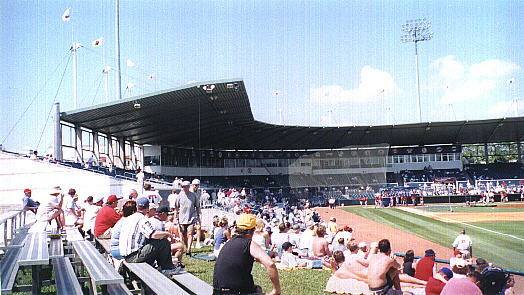 Here you will see many fans sitting upon the lawn area of the stadium. City of Palms Park is larger than most stadiums, but somehow it is able to provide a good view from almost anywhere. The stadium is kept extremely clean, which is a definite plus. Autograph tip: wait along the left and right field lines to get players autographs before the game. After the game, to get the visiting team's autographs, find the exit of the locker room located on the first base side of the stadium on the concourse, and get players to sign as they go to the bus. I saw a man who got nearly every member of the opposing World Champion Yankees by doing this.